These instructions are intended for use by an authorized Evinrude® or Johnson® dealer's service technician. The installation of this kit includes procedures best performed by a qualified service technician with service literature and special tools. This kit adds 35 amp charging capability to CC and later 120 and 140 models, and may also be used on 125 WTP electric start commercial models. The flywheel in this kit does not have a rope groove for an emergency starting rope. It will not be possible to rope start this motor after this kit is installed. Important: Read complete installation instructions prior to starting work. This kit should be installed by a trained service technician using current technical literature. These instructions are not intended for consumer use. Inform the owner to make note in his Owner's Manual that he will be longer have the ability to emergency rope start this engine. Give these installation instructions to the owner. They contain information vital to the continued safe use of the product. Important: Retain these instructions with your Owner's Manual. 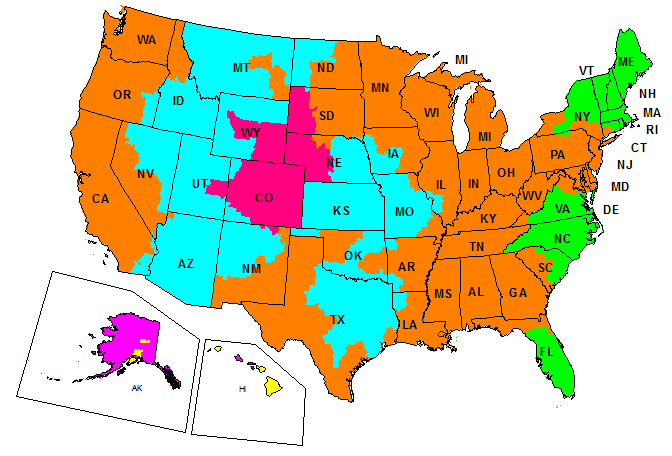 They contain installation information for reference. Check contents of kit to become familiar with new parts to be installed. NOTE: To prevent damage to electrical components disconnect battery cables before removing any electrical connections. To prevent accidental starting disconnect all spark plug leads. Remove flywheel. See Section 3. Ignition System - Flywheel Servicing in Service Manual for proper procedures. Remove two nuts (A) and two screws (B) securing the powerpack (C). Lift the powerpack up and take note of the position of the various connectors and electrical wires. Disconnect the starboard and port 4-pin and 5-pin connectors (D), the 2-pin connector (E) and the single-pin connector (F). Loosen the two screws securing the solenoid (G) and pull solenoid, clamps, and screws away from bracket. Remove two double-end screws (H). Remove all of the wires from the terminal board (I). Disconnect the bullet connectors in the yellow with red stripe and the brown wires (J) and the brown wire (K) to the port temperature sensor. Remove the terminal board from the rectifier/regulator (L). Remove the screws. and remove and discard the rectifier/regulator assembly. NOTE: Remove all of the gasket and sealant from the block surface. Do not let any gasket material fall into the water passage. Install a new gasket (1) Gasket Sealing Compound on both sides. Install the 35 amp rectifier/regulator (2). The two short screws with starwashers go in the forward mounting holes (N). Tighten the screws evenly, and torque the screws to 36-84 in. lbs. (4-9 Nm). Install the terminal block on the rectifier/regulator assembly. Remove the four screws (O) securing the stator assembly. Cut the tie straps (P) securing the stator leads, timer base leads and wiring harness together. Push throttle connector (Q) out of timer base arm. Remove four timer base screws and retainers (R). Lift timer base off motor. Remove and save the eight upper bearing housing screws, wiring clip (S) and timer base stop (T). Install a universal puller on the forward starboard and rear port posts of the bearing housing and pull the bearing housing out of the motor. Remove the timing adjustment screw (U) from the old bearing assembly and install in the new assembly (3). Apply Triple-Guard® grease to the O-ring grooves. Install the O-rings (4) and apply grease to the O-rings and bearing housing O.D. 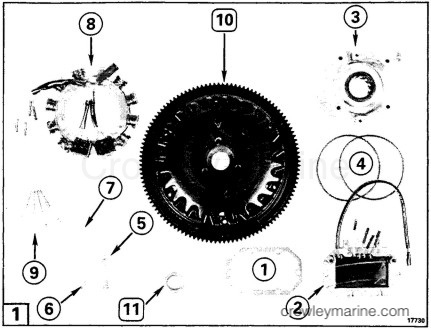 Apply grease to the lip of the upper crankshaft seal (V). Install bearing housing by tapping an alternate sides with soft mallet keeping screw holes aligned. Apply Locquic Primer and Nut Lock to the screws. Install the screws with the cable clamp and stop screw as they were when removed. Tighten screws evenly, and torque to 72-96 in. lbs. (8-11 Nm). Apply outboard oil to the timer base retaining ring (W). Apply a light coating of Moly Lube to the crankcase head bearing surface (X) and to the timer base bushing (Y). Compress the retainer ring (W) and install the timer base. Install the new retaining clips (5), retaining clip screws (6) and leads retainer (7) as shown (leads retainer on top of retaining clip). Connect the throttle rod, tighten screws etc. See Section 3. Ignition System - Timer Base Servicing in the Service Manual. Place new stator assembly (8) on bearing housing with leads behind retainer (A). Apply Locquic Primer and Nut Lock to the stator screws (9). Tighten screws to a torque of 120-144 in. lbs. (14-16 Nm). See Section 3. 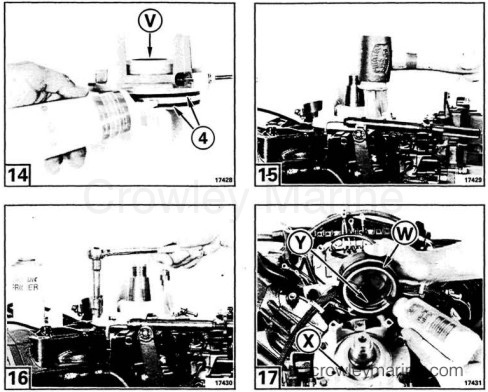 Ignition System - Stator Servicing in the Service Manual. Loosely tie strap the stator output wires (B), the wiring harness wires (C) and the red rectifier output wire (D) together. Reinstall the electrical bracket on the motor with the two double-end screws in the rear bracket holes (E). All of the wires tie-strapped together are routed under the middle of the bracket. Tighten the tie strap securely. Connect the stator, rectifier/regulator, and wiring harness wires to the terminal board. Follow the wiring diagram on the back of the electrical bracket. Note that only one red wire (F) will be attached to the red terminal. Lift the powerpack up to connect the orange and orange/black wires. Connect the brown and the yellow with red stripe wire bullet connectors (G). Connect the brown to tan port temperature switch bullet connector (H). Connect the brown and brown/yellow 2-pin Amphenol connectors (I). Connect the starboard and port 4 and 5-pin Amphenol connectors. Place the 4-pin connector in the starboard recess and the 2-pin and 5-pin connectors in the port recess. Place the powerpack/cover over the electrical bracket. Arrange the wires so the powerpack will fit down over all the connections and so the wires at the port and starboard sides pass out through the notch in the electrical bracket. Secure the powerpack on the electrical bracket with the pack ground wire on the starboard stud (J), the wire clamp on the starboard forward screw (K), and the long screw in the forward port location (L). Connect the rectifier/regulator output wire (M) to the starter solenoid battery side terminal (N) next to the other wires. Reinstall the starter solenoid (O) to the electrical bracket. 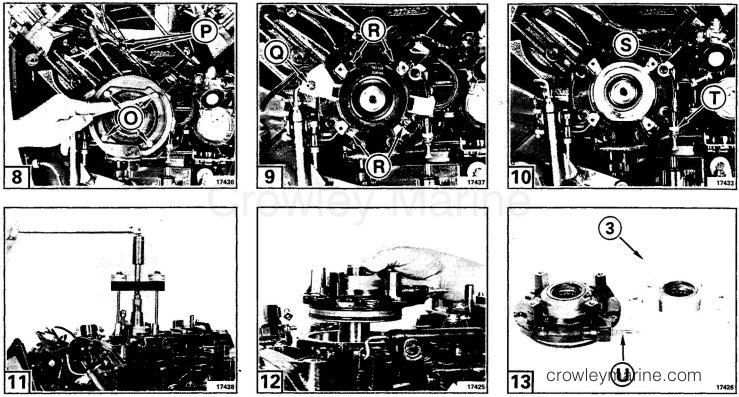 Install the new 35 amp flywheel (10), and nut (11). See Section 3. 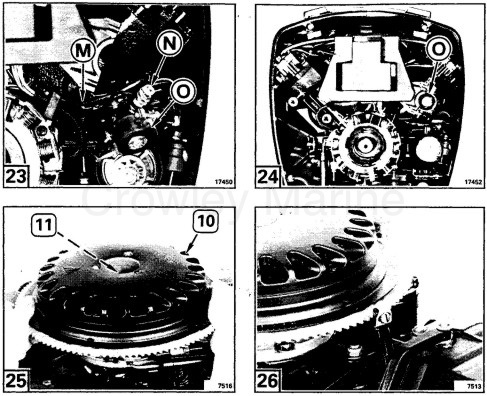 Ignition System - Flywheel Servicing Information in the Service Manual. NOTE: See Section 1. General Information - Synchronization and Linkage Adjustments in the Service Manual for timing pointer adjustments, throttle plate synchronization, cam pick-up, wide-open-throttle stop, maximum spark advance, and idle timing. All of these steps MUST be completed when any major electrical components has been replaced. The new charging system may now be tested for output. A load bank tester or a carbon pile tester, either capable of drawing at least 35 amps, must be used for this test. See Section 7. Electrical System - Running Test, Alternator Output and Rectifier/Regulator Tests in the Service Manual. NOTE: Run the engine with Test Wheel, P/N 387388. Do not run the engine with a propeller or flushing adapter for this test. Engine should be secured in test tank or mounted on boat, tied securely to dock while test is performed.